Price is $5,350 diving / US$4,815 non-diving. Price indicated is $AU but varies depending on exchange rate. This tour is specially designed around the chance to see incredible wildlife around the rich Banda Sea and Raja Ampat. 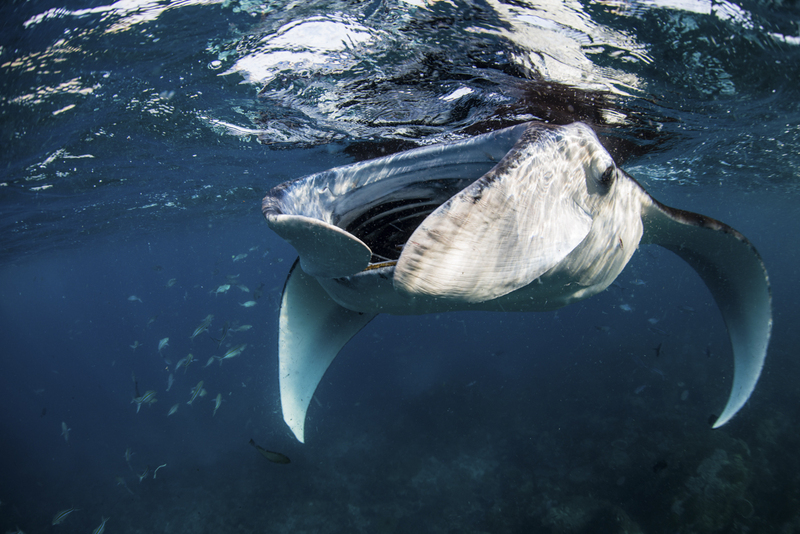 Expert-led, this trip will include the opportunity to explore for Blue Whales, snorkel/dive with Hammerhead Sharks and Manta Rays, and explore the paradise lagoons of Misool in Raja Ampat. For centuries, indigenous islanders traded nutmeg, which was found only here. They were colonised by the Portuguese then Dutch. Today the islands are visited by Pindito’s new adventurers. The colonies are still visible and this trip is especially exciting as its combined with Raja Ampat, giving explorers the chance to see some of the world’s most beautiful, diverse and fascinating locations, full of megafauna such as Blue Whales, Manta Rays and Oceanic Sharks. This trip will include up to two dives a day (on average), with some time exploring the communities and other wildlife offshore. This is suitable for both divers and non-divers. As recently as 2014, scientists published the first satellite tracking of Blue Whales into the Banda Sea off Indonesia. These are the same Blue Whales that migrate along Australia’s west coast. The Swiss Captain of our vessel has seen many Blue Whales in his lifetime, in this area and in October, not only are there still good numbers of Blues around but the conditions are favourable, as the monsoon will have ended. On this exclusive expedition, you will travel into the heart of one of the world’s most important Blue Whale areas, in the Banda Sea, off Indonesia. Banda Neira: the main island of "Banda", part of the Maluku archipelago consist of 10 small volcanic islands. Visit the old fortress of the Dutchman or climb a volcano. Over 20 years ago lava flowed into the sea and formed a hard coral garden here. Misool: visiting this endless maze of islands is a special treat for anyone. It is paradise and one of the most biodiverse regions in the world. Soft corals and sea fans (diameter of 3-4 meters) in all sizes and colors dominate the underwater landscape. Dampier Straight: The straight separates the Birdshead Peninsula from Waigeo and Mansuar. The name comes from Dutch colonial times but it is also home to birds of paradise. The Pacific Ocean meets the Halmahera Sea with an explosion of marine life: Manta rays, reef sharks, mackerel, tuna and barracuda, Even Bryde's whales and pilot whales. Indicative itinerary: Animals and weather dictate the finer details of our cruise itinerary but the trip roughly goes from from Ambon to Saparua, and Nusa Laut & the Banda Islands. We follow the east coast of Ceram to Misool, then continue via Jef Fam into the Dampier Straight before the journey ends in Sorong. The Pindito has been working in these regions for over 25 years. Despite being a wooden vessel, she provides a level of comfort and hospitality superior to many similar vessels. Her cabins are spacious and comfortable, each with private ensuite and air-conditioning. She is also very sea-worthy, fitted twin stabilisers and very quiet. She rarely raises sales (wind conditions aren’t sufficient) and the engines are quiet-enough to be hardly heard at all on deck. Vibration is minimal so use of telescopes and binoculars on deck is quite reasonable. The crew are very experienced and accommodate both divers and non-divers equally. There are three rigid inflatable boats for excursions (including heading out to see whales) and plenty of in-water guides to look after any level of competency. Diving is absolutely not essential. Non-divers automatically get a 10% discount but there is the option to try a ‘discovery dive’ if that interests you. The crew are extremely interested in wildlife. While other vessels may cruise on by, they will spend time with animals learning with you and dispensing all their knowledge. The itineraries on these trips are not fixed. The vessel is a vehicle to explore and there are as many options as there are variations in wind direction and animal behaviour. Passenger comfort is the most important thing, so an itinerary will be sought that focuses on ensuring everyone has a pleasant journey. For the most part, sea conditions in the tropics are quite calm. All meals and drinks on board (excluding wine). Continual wildlife-watching and interpretation, plus zodiac excursions. Any kind of beverages while in transit.